Deb's Cup of Tea: Time to conduct an experiment. You have, no doubt, heard about these bags. Perhaps you have even purchased chips in them. 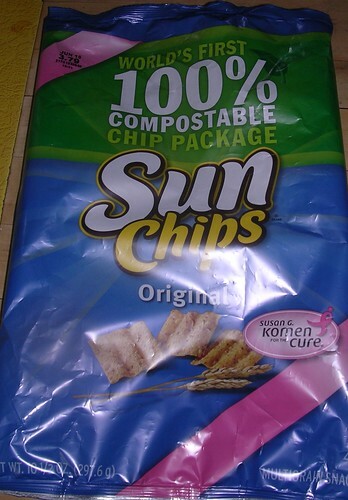 As Sun Chips were Carole's favorite, I bought a bag for her visit. The bag is empty and I have decided to test this 100% compostable idea. Tomorrow, I am tossing the bag into the compost bin. I don't have that much on a daily basis, to add to the bin so we will see just how long it takes for this to break down, if it ever does. I'll spare the photos of the compost bin. I felt the bag was flimsy when I picked it up. The other kind of chip bag seems more sturdy. I thought just picking the bag up would break the chips into a million pieces. Honestly, I don't think I saw more small pieces at the bottom than usual, but I do admit that I don't eat chips that often to compare. So, we'll see. Will this compost as advertised or just sit in the compost bin like any other piece of non-vegetable/fruit waste?